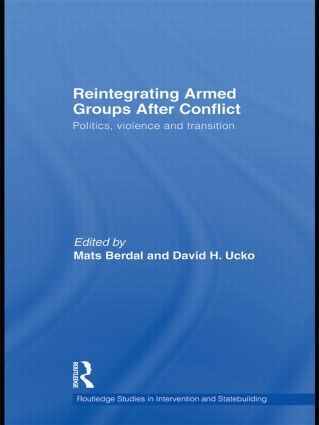 This book looks at the political reintegration of armed groups after civil wars and the challenges of transforming ‘rebel’, ‘insurgent’ or other non-state armed groups into viable political entities. Drawing on eight case studies, the definition of ‘armed groups’ here ranges from militias, paramilitary forces, police units of various kinds to intelligence outfits. Likewise, the definition of ‘political integration’ or ‘re-integration’ has not been restricted to the formation of political parties, but is understood broadly as active participation in politics, policy-making or public debate through parties, newspapers, social organisations, think-tanks, NGOs or public service. The book seeks to locate or contextualise individual cases within their distinctive social, cultural and historical settings. As such it differs from much of the donor-driven literature that has tended to abstract the challenge of disarmament, demobilisation and reintegration (DDR) from their political and historical context, focusing instead on technical or bureaucratic issues raised by the DDR process. Among the issues covered by the volume as a whole, three stand out: first, the role of political settlements in creating legitimate opportunities for erstwhile leaders of armed factions; second, the ability of reintegration programmes to create genuine socio-economic opportunities that can absorb former fighters as functional members of their communities; and third, the processes involved in transforming an entire rebel movement into a viable political party, movement or, more generally, allowing it to participate in political life. This book will be of great interest to students of security and development, peace and conflict studies, and IR in general, as well as practitioners and policymakers. Mats Berdal is Professor of Security and Development in the Department of War Studies at King’s College London. From 2000 to 2003 he was Director of Studies at the International Institute for Strategic Studies (IISS) in London. Mats Berdal is a Visiting Professor at the National Defence and Command College, Oslo. David Ucko is the Programme Coordinator & Research Fellow for the Conflict, Security & Development Research Group, King's College London.